The guesthouse consists of 13 rooms which allows us to provide you with a personalised service during your stay. Our location is an easy hop to the morning buses for Samaria Gorge. 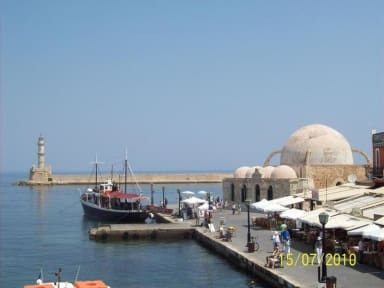 We are also just two minutes from Chania center and a 5 minute walk from the old town and the Venetian harbour.. While here you will enjoy our bright, airy and clean rooms and our spacious courtyard with banana trees. Great place! Loved the tiny lift....added some adventure! Basic accommodation but has everything you need, is clean and great location . Incredibly handy for bus station and an early bus to Omalos to walk the gorge. Friendly owner. 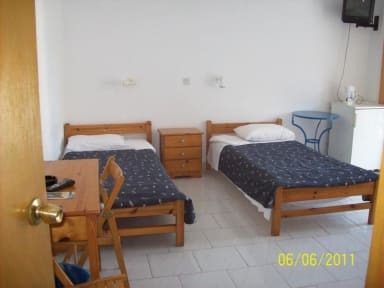 Great place to stay if passing through Chania.Right beside bus station & apartments have all you need for a short stay. The hostel was in an awesome location and the staff were lovely. The bathrooms could have been cleaner but definitely wasn't the worst I've seen. Only downside was that the rooms were very hot and there was only 1 small fan for the entire room. Other than that we had a comfortable stay! Wonderful helpful staff. Rooms are well equipped but very old, resulting in unpleasant smell coming from the drainage in the bathroom. Bring earplugs if sensitive to noise. Perfect for an overnight stay if need to catch a bus the following morning. Otherwise, consider other places - Chiana is very small; almost everything is within walking distance. Nice location close to Chania old town. Rooms not cleaned everyday, but still nice. This little hotel is very close to the bus station, and that is a plus! It also has a little shop across the road to buy water and bread and fruit. This was super convenient. I didn't rate the room all that highly as the floor felt very dirty and the power outlet near the bed was broken (annoying). There were also really noisy residents gabbing in the hallway at night and slamming doors, which wasn't ideal. But hey, you get what you pay for and it is very cheap.